A consultation will be necessary so that your cosmetic specialist can determine how many treatments you will need to achieve ideal results. You will need somewhere between three and six treatments, spaced three to six weeks apart each, with four being the average number of treatments. You will also discuss the number of syringes that will be used (each syringe costs $400 to $550 and you will most likely need multiple syringes per session), the total cost of the procedure and financing. The more areas you want treated and the more shallow or lined your skin, the more facial filler you'll need. Each session of your Sculptra treatment will be similar. First, your cosmetic specialist will use a special marker to mark the places where she will be injecting the facial filler. She will likely dot a line in a curve-shape along sunken eyes, an indented chin, hallowed cheeks or other age lines. Next, unless you request not to have it and/or the area to be treated is very small, you will be injected with anesthetic. This may be locally injected at the area(s) to be treated or you may have anesthetic injected directly into your facial nerves via the top of your mouth, behind the lip. Once you've been sufficiently numbed, your cosmetic specialist will then begin the shallow injections into the middle layer of your skin, one injection at a time. After each injection, she will take a cotton swab and massage the area to help spread the filler. She will then repeat the injection/massage process. Although each session will require multiple injections--the number of injections varies, but the greater the area(s) treated and the deeper the lines or hallows, the more injections you will require--the injection/massage process is actually fairly quick. 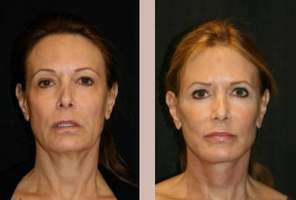 The average session for this facial filler lasts between fifteen and thirty minutes. After your sessions, you will be free to resume most activities, but you must be careful to wear sunscreen at all times when the sun is out (even if it's a cloudy day). You will most likely be asked to massage the skin and keep swelling to a minimum by applying an ice pack to your skin for the first one to two days. Your skin may be red, swollen and slightly bruised for up to a week, but this is normal and should only cause alarm if the skin looks overly inflamed or is excessively painful. Remember that a minimum of three and up to six sessions of Sculptra are necessary before you see ideal results. However, you can expect to see gradual, natural-looking improvement after each session in your nine- to thirty-six week treatment, which must be maintained every two years.